New Myphone smartphone spotted by TechConnectPh. According to them, when they visit a SM branch they been surprise what they see on a catalog! 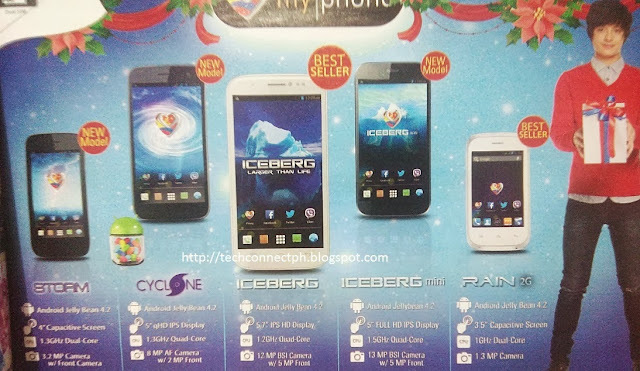 3 new MyPhone has been born(MyPhone Agua Iceberg Mini, MyPhone Cyclone and MyPhone Storm) seem to be the best seller on the Christmas Season. This smartphones not yet announce on their Official Facebook page and to their website. The cheapest to this new smartphone is the MyPhone Storm. It cost Php 2,988- running with the latest Android 4.2 Jelly bean, 4-inch IPS LCD, 1.3 Ghz Dual-Core processor and 3.2 MP Rear and VGA front camera. Next is the MyPhone Cyclone, it cost Php6,988, same as the Storm it runs Android 4.2 Jelly bean but higher processor(1.3ghz quad-core), 1GB Ram, better camera(8MP AF Camera / 2MP Front), and larger screen(5-inch qHD IPS). MyPhone Agua Iceberg Mini priced at Php12,388, it also runs android 4.2 jelly bean with 5-inch IPS LCD with full HD resolution and Gorilla Glass 2 for scratch resistance, Iceberg mini ispowered by a 1.5GHz quad-core processor. And take note this Iceberg Mini is higher Ram(2GB) versus the MyPhone Iceberg (1Gb). The Iceberg Mini also have a 13-megapixel rear camera and 5-megapixel front camera. Note that all the specs and prices above is to be confirmed by Myphone. All of the three new smartphones is equipped with Theft Apprehension Asset Recovery (TARA). This is a built-in Anti-theft technology which can remotely disable your handset to secure your data in case the phone gets stolen or lost. TARA is a proudly Pinoy App and exclusive to MyPhone users.